With extensive training and practice in internal medicine, dermatology, pathology and surgery, Dr. Christopher Crotty welcomes the challenge of difficult diagnostic and therapeutic problems of the skin, hair and nails of adults and children. As a skin cancer surgeon, Dr. Crotty uses a frozen-section technique known as Mohs micrographic surgery to minimize scarring and recurrence of cancer cells. Other surgical techniques he employs include cryosurgery, electrosurgery, skin grafting and plastic reconstruction. Dr. Crotty was one of the first doctors in the area to use a variety of lasers for removal of blemishes, birthmarks, acne scars, age spots, tattoos and moles, and has been a member of the American Society of Cutaneous Laser Surgery since 1983. Dr. Crotty also practices a full spectrum of cosmetic dermatological procedures. These include laser resurfacing, Fraxel laser, microlaser peels, and chemical peels for wrinkles, aging and sun-damaged skin. In addition, Dr. Crotty offers microdermabrasion, glycolic acid and salicylic acid peels for acne and sun damaged skin as well as sclerotherapy for spider veins. Sand Lake Dermatology center also offers many treatments for psoriasis and vitilgo including narrow band and PUVA phototherapy, the excimer laser and numerous systematic and biologic therapies. Dr. Crotty is a member of the American Academy of Cosmetic Surgery and the American Society of Dermatological Surgery. A 1972 graduate of Notre Dame University, Dr. Crotty attended the University of Nebraska School of Medicine where he received his M.D. in 1975. After medical school training, he completed a residency in internal medicine at Denver’s Presbyterian Medical Center. While serving with the Direct Relief Foundation as a volunteer physician on American Samoa, he decided to become a dermatologist and was accepted into a dermatology residency at the Mayo Graduate School of Medicine in Minnesota. 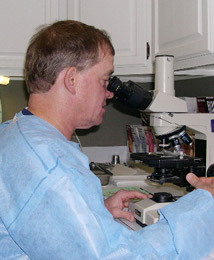 While at the Mayo Clinic he studied under Dr. Fred Mohs where he learned the Mohs micrographic surgical technique. Awarded the prestigious Osborne Fellowship, he continued his studies in the specialty of dermatopathology under the tutelage of Dr. A. Bernard Ackerman at New York University. After six years of practicing dermatology and dermatopathology in Omaha, Nebraska, and teaching as an assistant clinical professor at the University of Nebraska Medical Center and at Creighton University, Dr. Crotty moved to Orlando, establishing Sand Lake Dermatology Center in 1988. He is married and has six sons. A former president of the Central Florida Society of Dermatology, Dr. Crotty has served as an active participant since 1991. He is a member of the Leader’s Society of the American Academy of Dermatology, the Sorin Society at the University of Notre Dame and the Doctor’s Mayo Society. As an assistant clinical professor at the University of South Florida Medical Center, he continues to teach dermatology and dermatopathology to residents. He also serves on the admission committee of the UCF School of Medicine. He has published over a dozen scientific papers in leading specialty journals and has presented papers at national and international medical meetings. He has been featured on radio and television. Dr. Crotty has served on the American Academy of Dermatology Advisory Board and has served on the teaching faculty of the American Academy of Dermatology. He was named PCAN Volunteer Physician of the Year in 2006 and has been named one of Orlando’s “Top Doctors” by Orlando magazine on several occasions. For the past nine years, Dr. Crotty has led a team of volunteer physicians on a medical mission trip to Jamaica.